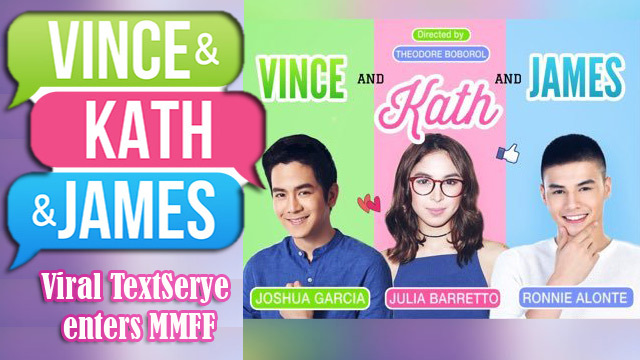 Ted Boborol is still in shock when his film “Vince & Kath & James” starring Julia Barretto, Joshua Garcia, and Ronnie Alonte became part of the 8 official entries for the Metro Manila Film Festival 2016 (MMFF). When he was interviewed by Push, he revealed that they were worried because out of 3 films that Star Cinema submitted, they are the dark horse and no one expected them to be chosen. First, they are not a big budget film and secondly, they have amateur actors in the cast and Boborol himself is a new director however, they still able to exert and produce a quality film. The Be My Lady co-director also divulged that Star Cinema doesn’t originally plan to let their film join at the yearly festival but when the management watched it, they decided to make it as one of their entries. Direk Ted also added that as a filmmaker, he will make sure that the audiences’ money and time will be worth it. If it’s for mainstream or romantic comedy, he wants the public to love the film because of its high standard and not just for high ticket sales. He was also asked for his opinion when “The Super Parental Guardians” starring Vice Ganda & Coco Martin and “Extra Service” starring Arci Munoz and Coleen Garcia failed to make it on the top 8. He stressed that he knows the hardship of making a movie so he don’t want to say that their film is better than them. This will be the 2nd film for Boborol after directing “Just The Way You Are” by Enrique Gil and Liza Soberano. Meanwhile Nicanor Tiongson, a head of the executive committee for MMFF reiterated that they will showcase films that have substance. He was also asked about the absence of blockbuster films with big stars and he replied that commercial success is not their first concern but the quality. With a proper marketing, the 8 entries will become a hit. Alongside “Vince & Kath & James”, other films were “Die Beautiful”, “Ang Babae Sa Septic Tank 2”, “Oro”, “Seklusyon”, “Saving Sally”, “Sunday Beauty Queen” and “Kabisera”.